Davis, my most recent WordPress theme, is now available as a free download from WordPress.org. 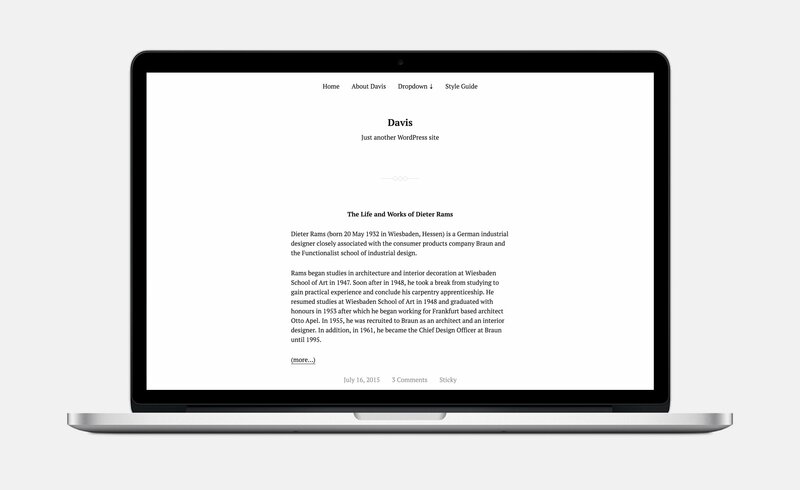 Davis is a clean, lightweight and simple WordPress theme for bloggers. It can also be used as a starter theme for more complex sites, and its small footprint – just three PHP files – makes it ideal for people looking to get started with WordPress theme development. You can download it via WordPress.org, and read more about it and see a demo here. Davis started out as an experiment. I wanted to see how small I could make a theme while adhering to the WordPress.org theme depository rules, and while still making the theme be useful for regular users. It wound up weighing in at 90 kilobytes, of which the screenshot.png takes up 62 kilobytes. I wouldn’t necessarily say I named Davis after someone in particular, but due to the name it ended up with, I did wind up keeping a specific person in mind while building it. That person is the video game journalist Ryan Davis, who passed away in 2013. I had spent years watching and listening to Ryan Davis on Giant Bomb (it’s a website, about video games), and his death hit me hard. Harder than any deaths outside of personal friends and family members. If you’re a movie and/or video game buff, I encourage you to check out his video series about movies based on video games: This Aint No Game (TANG).